Movie Night: Half Man, Half Ant, All Terror! 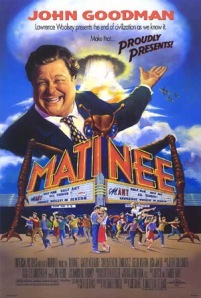 This week's review is of the movie Matinee (1993) with John Goodman, Matinee is a movie that I haven't seen in years, until recently and I think I like it more now than I did when it first came out. I guess I couldn't appreciate it as much when I was younger. This movie is a throwback to the big-bug horror films from the 50's. John Goodman plays Lawrence Woolsey, a small time movie producer bringing his latest feature Mant to Key West during the Cuban Missile Crisis. I am guessing his character is meant to be a homage to William Castle, who was known for his gimmicks and theatrics to draw in an audience. The first half of the film focuses mainly on Gene, a navy brat whose Dad just got shipped out to Cuba as the missile crisis begins. He is a huge horror movie fan and after meeting Woolsey, begins helping him out with his promotion. The town has a huge fear of nuclear attack so everyone is already on edge and Woolsey uses this to his advantage to further shock and terrify the audience. Most of the film is centered around Gene and his friends, Goodman's role seems to almost be just a side note but ends up being more of a father figure of sorts as the film goes on. Seeing this movie really makes me wish I could have been around to see a time when movies were really made and promoted this way. I feel a lot of movies lack this very theatrical side to them these days and I have to say it is quite a disappointment. No movie is perfect and there there are a few things I wish were done differently but overal I thoroughly enjoyed this film and have to give it an A-.